It’s exam season, so there are a lot of highly strung people round college at the moment! I never really notice when I get stressed. It just bottles itself up inside me and usually something silly happens (I forget my keys, ruin my dinner, etc), I have a meltdown (like the time I had all the problems on a coach back from Bristol. I wrote about it here) and it’s only then that I realise how stressed I am. This involves crying and hysterics and is generally embarrassing for myself and anyone around me. There’s not a lot I can do to stop this, but there are a few things I think really help post-breakdown to show me things in perspective and realise it’s not the end of the world. I’ve talked about it before (here) and I find it such a great way to relax. Just doing lots of stretching and long breaths, and really focusing in on the different sensations as you do each position is so calming. Yoga With Adriene has an amazing routine specifically for stress, and this helped me loads after my latest meltdown. Just have a chat. Chances are, they’re stressed about something too and you can vent to each other. They’ll also have an outsiders view and can maybe help you realise that just because you have an exam, doesn’t mean your life is going to end. I personally find comfort eating helps. I’m not suggesting going overboard and scoffing on junk food 24/7, but some cake, cookies or ice cream can make you (at least temporarily) happier and might help you get through the stress. 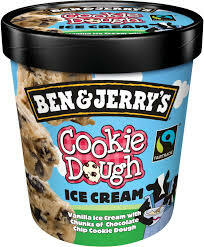 Ben and Jerry’s Cookie Dough Ice Cream is my personal favourite. This one especially if you’re stressed about stuff going on at Uni (exams, friends, house, boys, girls etc.). Sometimes going home, even for 1 night, can remove you from everything and help you to see the situation in a more rational way. I often find it hard to see things clearly when I’m stuck in the ‘Trinity bubble’. Free time. Take a day off! One day of chilling won’t make or break your exam. If, like me, you’re doing music, maybe just listen to the repertoire you’re learning, or play some easy scales to keep your fingers moving, but nothing too intense. If it’s academic, then perhaps just read through your notes, and then leave them and go out and do something. Even if you move from your desk to the living room and end up watching tv all day, having a veg day could be exactly what your brain needs. These are a few things that help me to step back, take a breath and be ready to start afresh the next day. I can’t wait until Thursday afternoon, when I’ll be exam-free and able to start my summer!